The Music Branch (1921–1940) of the Community Arts Association reorganized and incorporated under its present name, Community Arts Music Association of Santa Barbara, Inc. (CAMA), in 1940. Mrs. Francis Price was the first chairman of the “new” organization. Roger Phillips notes that even “as the war clouds of the 40s billowed ominously overhead CAMA continued to present a string of concerts…” In the years 1940–1942, Artur Rubinstein (piano), Marian Anderson, Martha Graham, Isaac Stern, Nathan Milstein (violin), Sergei Rachmaninoff (piano), Jan Peerce (tenor), and Vladimir Horowitz all visited Santa Barbara. In 1942|43 the Association was commended for its participation in the Chamber of Commerce’s “Thumbs Up Throughout the War” Campaign. The 1942|43 Season was CAMA’s only “dark year” and there was no regular lineup of concerts. 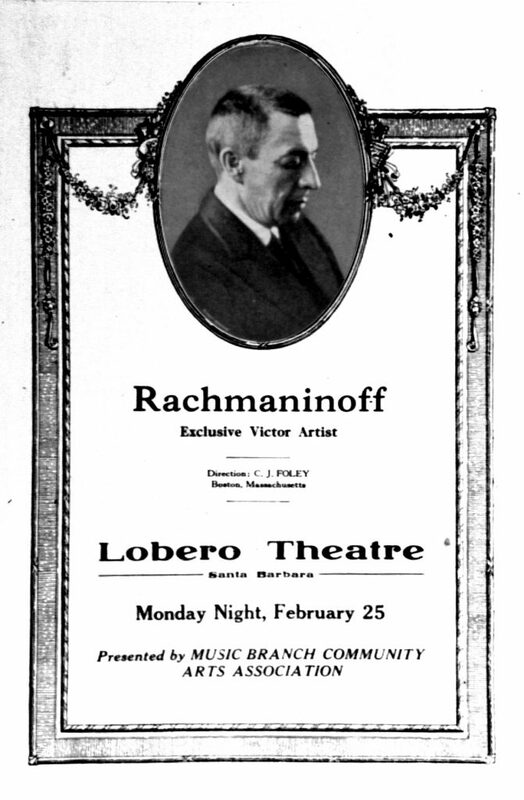 It is thus also one of only three seasons since its founding in 1919 in which the Los Angeles Philharmonic did not appear in Santa Barbara. This “dim out” broke toward the end of 1943 with a September 21 recital by soprano Lotte Lehmann, followed by a December 7 concert by the Los Angeles Philharmonic. During the 1940s, in addition to recitals by legendary soloists, CAMA also presented the Los Angeles Philharmonic (up to five times per season) with conductors Leopold Stokowski, Bruno Walter, Sir John Barbirolli, Alfred Wallenstein, George Szell, and John Barnett.